During Fathers' Day weekend, I had my radar tuned to the fathers that were coming through. When I took the time to zero in on them, I was heartened to notice a great bunch of guys—it gives me lots of optimism and faith in the future. It’s a complex responsibility to be a good dad. Modern dads are supposed to be everything their dads were, and also everything that they weren’t. They help run households and do dishes. They contribute to the family income. Sometimes as sole supporter. Then the pressure is really on, especially during harder economic times. They’re supposed to be competent and successful in their careers. After all, they’re setting an example for their kids. They should also be following their dreams, because—don’t we all want our kids to follow their dreams too? Then, there's extra curricular activities. Chauffeur, coach, the referee, the fan, the troop leader, the tutor, the counselor. Dads are supposed to help build, help organize, help the community. We all know that good dads fix stuff, because the stuff is always breaking. They really should exercise regularly, be fit and keep stress at bay. And—they should be sleeping at least 8 hours a night, because otherwise, they get a little testy and impatient. On top of all that, when is the time to get to know their kids? And who has time to go fishing???? The dirty rotten secret is that nobody has time to do it all perfectly. Something has to give. (The grandparents seem to understand this best—but that’s a different story). The trick is—the “taking the time to get to know your kids” piece. It can be hard to quantify that, and it doesn’t fit neatly into the Saturday list along with mowing the lawn. But the ones I saw this weekend have found one way. 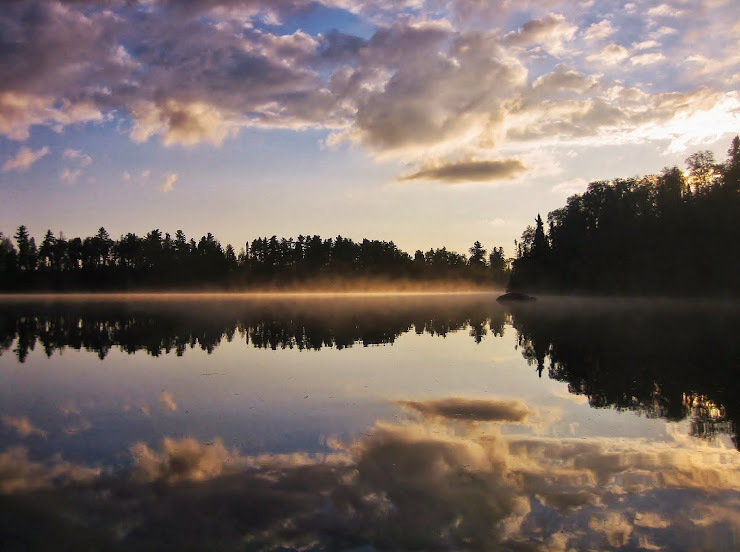 Once these families get into the BWCA---so many complexities fall away. Dads don’t burn the candle at both ends out there, so first they can relax and sleep. Phones can’t ring, laptops don’t work, can’t be late for anything really, the car can’t break down…..what a rare treat—well rested, no list, only “time to get to know your kid”. Boyscout Troop 74 from Manhattan Kansas came off the water on Saturday—each group had taken a different route all the way to Alice Lake (64 miles total)-a lot of dads, a lot of sons. All in Tuscarora Portage Survivor tshirts. Wade and his son are BWCAW veterans. Can’t you tell by looking at him that he knows EXACTLY how and where to catch fish on Tuscarora Lake? He’s got a wealth of information. Bryan is in the wilderness right now. He wanted to spend Father’s Day in the nothwoods, to honor the memory of his dad who recently died. Evidently, the peace of the place offers him gentle solace and joy as he’s grieving. A belated Happy Father’s Day to all the dads working so hard to be good ones. We sure do appreciate you.